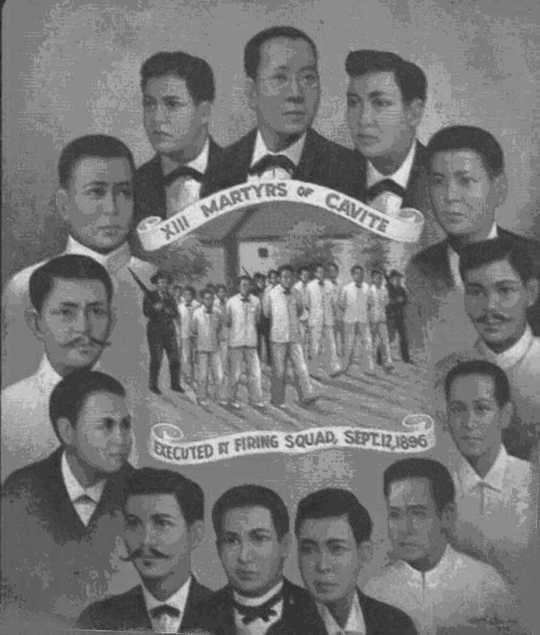 On January 4, 1897, 11 of the 15 Bicol Martyrs were executed in Bagumbayan (present day Luneta park) five days after Dr. Jose Rizal was shot to death in the same place on December 30, 1896. The 15 Bicolanos, most of them masons, were among the first victims of Spanish cruelty under Governor-General Camilo G. de Polavieja's administration which became extremely merciless against those it considered as traitors to Spain. Of the 15 martyrs, four died earlier while in exile or in prison. Father Inocencio Herrera, from Pateros, Rizal, who was choir master in the Cathedral of Nueva Caceres (present day Naga City). He was about 30 years old when he met his fate. Father Severino Diaz, a native of Bulan, Sorsogon, appointed as parish priest of the Nueva Caceres Cathedral. He was 45 year old. Father Gabriel Prieto, parish priest of Malinao, Albay. Manuel Abella, a native of Tayabas (now Quezon), was one of the wealthiest in Bicol and one of the oldest to be executed at the age of 60. Domingo Abella, a young surveyor who was kind-hearted and frank. Domingo, son of Manuel Abella, was 25 years old when he was executed. Camilo Jacob, a photographer and a native of Polangui, Albay. He was the prisoner who suffered the most torture with great fortitude. Tomas Prieto, an eminent pharmacist, well versed in the secrets of chemistry and botany. He was 30 years old at the time of his death. Macario Valentin, an mployees in the public works department of Nueva Caceres. Cornelio Mercado, an mployees in the public works department of Nueva Caceres. Mariano Melgarejo, an mployees in the public works department of Nueva Caceres. Florencio Lerma, from Quiapo, Manila, who went to Nueva Caceres. He was 35 when he died. Mariano Ordenanza, was sentenced to 20 years imprisonment and eventually died in prison. In their honor, a monument was erected in 1926 in Naga City. The monument is now at the Plaza Quince Martires, across from the San Francisco church.